Wildwood, New Jersey…the beach where legends have been made, dreams realized or crushed, the beach where our sport was born. The annual pilgrimage to this hallowed sand is a highlight of the season. Every year, friendships are made, adding to the anticipation of the next year’s event; champions are eager to return to repeat their victories; the vanquished are perhaps even more eager to return to even the score. Thirteen years ago, Roger Chewning, Mike Carroll, Olan Turner, and Fran Gramkowski staged the first ECSKC. This event featured several firsts – the organizers had published the first rulebook, first compulsory figures; indeed, this grand experiment formed the basis for our new sport. Scott Spencer served as field crew for ALL competitors…and this was before standoffs were invented, so you can imagine how hard he worked for the competitors. The judges sat at a table, and held scorecards aloft after each competitor’s performance. Fast-forward to May 22-25, 1998. Flawless weather, healthy fields for the sportkite events, top kite fliers and builders from all over the world in attendance; the stage was set for a most memorable weekend at Wildwood. Major sponsorship from Morey’s Piers allowed Sky Festivals to lavishly promote the event to the public, drawing decent crowds from the start of the festivities on Friday. We arrived in Wildwood shortly before noon on Friday, and were greeted with a full sky. Nothing like hundreds of square yards of nylon to erase the boredom of a ten hour drive! Friday afternoon was spent in many different fashions – serious sportkite competitors were drilling their routines, the art kite folks were flyin’ and grinnin’, and many other kiters just walked around, soaking it all up and seeing their friends after the long winter break. Friday evening saw the fliers enjoying the annual South Jersey Kite Fliers barbeque on the upper deck of the Rio Motel. Every year, the SJKF people reinvent the ultimate kite event meal, the sushi at this year’s party sets a new standard. Hats off to the SJKF! Once darkness fell, it was time for the annual night fly. 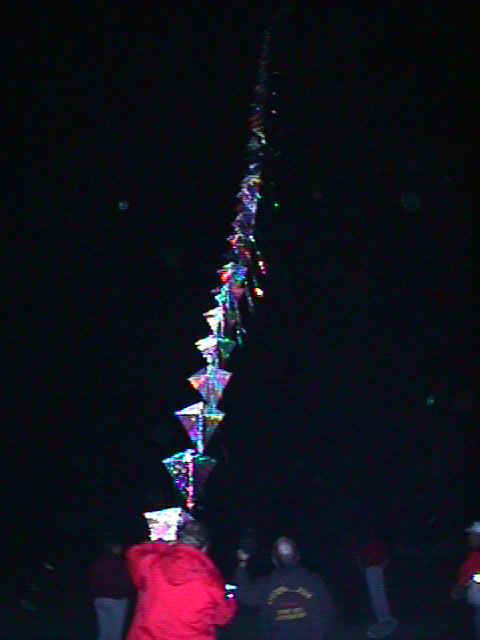 Highlights were numerous…Lee Sedgwick and his mylar Cube kite drew a great response from passers-by on the boardwalk; Pete Dolphin and Lee also impressed many with their trains of Eddy kites (both stacks built by Lee), but the winners were team “Shanti Air”, with six fliers performing aerial ballet with illuminated Opus 8’s. Great job, friends! Saturday ushered in the start of serious competition, and serious fun. Novice class saw Bruce Lindemann sweeping ballet and precision, flying an Illusion to tight victories over Dave Franzi in Precision, and Lisa Stambaugh in Ballet. 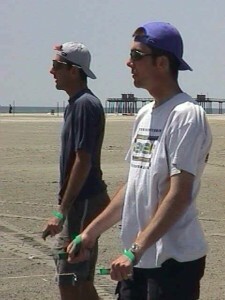 Our own Phil Napier rolled on, winning both Intermediate events, as he did at Ocean City. Experienced class saw Larry Bates taking the honors in Precision, while Michael Owens took Ballet. Masters Precision saw a great field of fliers finishing extremely closely. The twelve fliers scored within a seven point range, one of the closest fields in memory. When the dust settled, Michael Moore was crowned champion. Seventeen fliers contested the Masters Ballet event, featuring many great performances. Steve Karatzas took the honors, besting Dennis Smith and Scott Weider. Intermediate Quad featured great performances by all competitors, with Marion Proffit taking the win over Lisa Willoughby and Torrey Lindemann. Experienced class saw another tight field, Bruce Kapstan, Terry Murray and Dennis Desrosiers were separated by less than two points in the final standings. Intermediate Pairs Ballet featured Pepto Bizzamo winning the trophy, with Buzzin’ Bees and Just Fly also making the podium. Experienced class had Air Play, Q, and TWGR (Two White Guys Without Rhythm??) finishing in order. This event featured an event not normally seen in the US, Pairs Precision. This event is structured like Team Precision, with three compulsory figures followed by a freestyle routine. Evolver (James and Carl Robertshaw, from London, England) flew their Matrix kites to a stunning routine, taking the win over Aerial Assault and Wind Dancers. See our interview with the Robertshaw brothers here. One of the highlights of the weekend was Masters Pairs Ballet. A stout 7-team field entertained the crowd in the swirling winds. In a surprise upset, Aerial Assault (Mike Lin and Drew Davidson, from Toronto, Canada) took the victory over Evolver. Both teams flew incredibly complex routines with amazing execution. After being soundly beaten by Evolver at the Grand Haven event the previous week, Aerial Assault came to Wildwood with fire in their eyes, this fire was reflected in their ballet performance. A new standard has been set in the US for pairs routines thanks to these two fine teams. In their debut competition, Kitelife.com (Vern Balodis and Mike Gillard, Columbus, Ohio) took third place. KFAN, Sudden Flight, Wind Dancers, and Late For Supper also flew well and deserve congratulations. Experienced class saw four teams doing battle in variable winds. In Ballet, WATT flew crisp compulsories and a nicely flowing freestyle routine to victory, followed by Air Crackers, Richmond Air Force, and the Valli Girlz. Ballet saw Air Crackers getting the nod, with WATT, Valli Girlz and the Richmond Air Force taking the remaining spots. 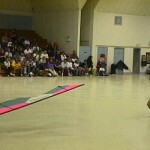 Masters Team Precision featured Shanti Air, Wind Wizards, and the Valli Boyz doing battle. The Valli Boyz took the victory over the Wind Wizards, with Shanti Air’s run of bad luck continuing. Shanti flies all six pilots in precision, making for a difficult task. 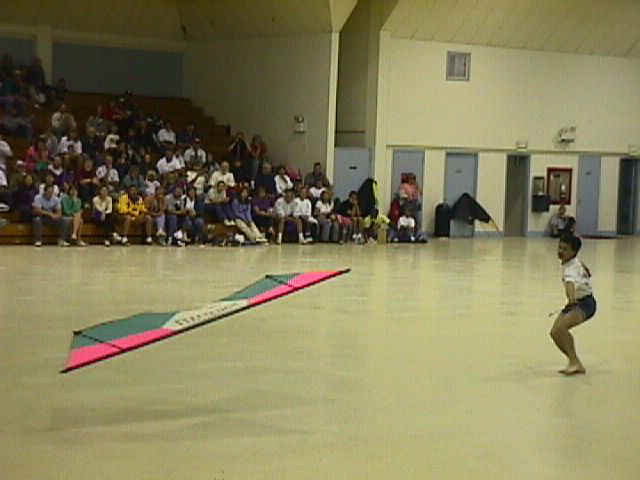 Several midair collisions threw their timing off, impacting the flow of their freestyle routine. Masters Team Ballet saw a turn in Shanti Air’s fortunes. Flying to music from Jurassic Park, they used their Opus 8s to great effect, drawing a great response from the audience. Several of the more intricate pieces in their ballet drew hoots and hollers, and upon completion of the performance, the applause was the loudest and longest of the weekend. A six-person team is difficult to do, but when it works, wow! Fine job, Al and teammates. Valli Boyz and Traffic Jam took the next two spots. 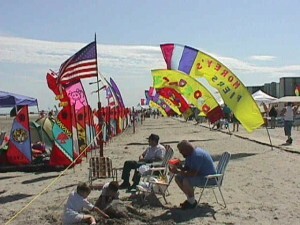 The Wind Wizards were on their way to a podium spot when they suffered a line break, sending kites tumbling to the ground. 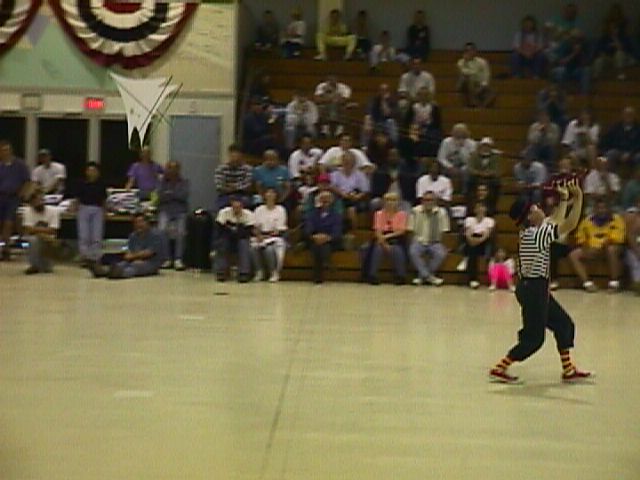 Another annual highlight at Wildwood is the World Indoor Championship, held on Memorial Day in the Wildwood Convention Center. In a hard-fought event, Drew Davidson was the winner, with our own Mike Reagan taking second, Lam Hoac in third. Ne sure to check out our photo gallery from this event! In our minds, if you can only attend one festival a year, Wildwood is certainly one to consider. We’ll see you at ECSKC 14 next May! This entry was posted in 1998, Competition, Events / Festivals, General Topics, Issue 3 (Jun), KL Archive, Reports and tagged Evolver, festival, robertshaw, Shanti Air, wildwood.